I wish I could claim this was entirely original, but I can’t. This was inspired, (ok, stolen) from a postcard that my coworker Bill received at the store today. The bit that follows was written by one of our customers (yeah, we get ’em all). I’ve taken the liberty of tarting it up a bit, but the following is basically what was written on the postcard. That’s the great thing about where I work: you just never know what’s going to happen next. Our database shows you are soon to celebrate another birthday; thus you are moving one more year further from the first and direst of all disasters, which is birth. Namely, your birth. 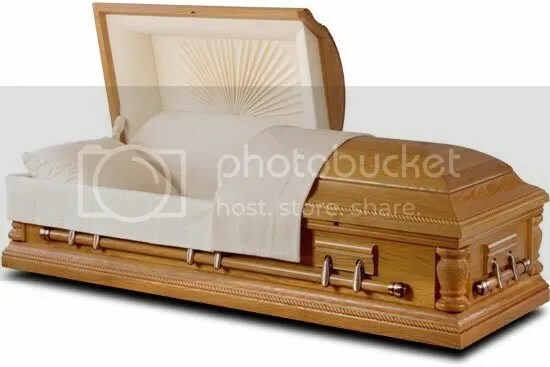 In any event, we here at Imperial Casket Co. want you to be ready for the day that is fast gaining on you with each passing birthday, the day on which you shuffle off this mortal coil and pass on to either a better place, or simply lapse into eternal oblivion. Either way, it can’t be any worse than this. So do yourself a favor and call us at 1-800-HE’S-GONE and let us help you with some advance planning with this extremely important (not to mention final) decision. And, lest we forget, have a Happy Birthday. Your Pals at the Imperial Casket Co. I was going to call the number to see if it’s valid, but I can’t find my phone…. Sounds like a really bad “over the hill” joke, LOL.